Pão de queijo is eaten as a snack (or even as part of breakfast) throughout Brazil. These little “cheese puff breads” are also served alongside bread in certain restaurants (especially the “churrascarias” – Brazilian barbeque restaurants). Originally from the region of Minas Gerais in Brazil, the traditional recipe uses a local cheese called “queijo minas” which is a mild white cheese with a medium consistency. When hard to find, most people substitute queijo minas with parmesan cheese which has a stronger flavor and harder consistency, while some also add mozzarella for the string cheese effect. I tried different combinations and I prefer to use feta cheese and either pecorino or parmesan for a stronger cheese flavor. These little “breads” are easy to make and naturally gluten-free since tapioca flour is used instead of wheat. The dough usually keeps well in the fridge for about a week (mine has never lasted that long). You can also freeze the dough (see note below) but I prefer not to freeze them and make a fresh batch. The traditional recipe uses oil (or butter), water and milk. I decreased the amount of oil and did not add milk. These are lighter in taste and fat content than most recipes. You can try different types of cheese and even add herbs and create your own version of pão de queijo! *NOTE: do not use store-bought packaged grated parmesan outside the refrigerated section of the supermarket as that is not fresh cheese and will alter the consistency. Mix the tapioca flour, cheese, and salt and set aside. The feta will easily crumble by hand once mixed into the tapioca flour. In a small sauce pan, boil the water and the oil. Carefully pour over the tapioca and cheese mixture and let the dry ingredients absorb the hot liquid for a few minutes. Then use a wooden spoon to mix until a dough is formed (it will become slightly cool to handle with your hands if you prefer to knead by hand, otherwise continue mixing with wooden spoon). Once the dough is cool, add the beaten egg and mix the dough with the wooden spoon (or by hand) until the egg is incorporated into the dough. You can either use the dough right away and spoon the mixture onto a baking sheet covered with parchment paper or a silicone mat; or once the dough is cool, you can store it in an airtight container in the refrigerator until ready to use. After a few hours (I prefer to leave it overnight) you can then shape the dough into small balls and bake. Freezing the dough: Once you make the dough into balls, you can place them on a baking sheet and put in the freezer for about 20-30 minutes. When completely frozen, you can then place them in a freezer bag to store until ready to bake. If using frozen pão de queijo, be sure to increase the baking time. Bake at 400◦F (1200◦C) for 10-12 minutes (if using frozen dough, bake for 15-18 minutes. Keep an eye on the pão de queijo while in the oven, depending on the size you make them and your oven, you may need to adjust temperature and time. Be careful not to overcook them to “golden” or they will become dry. I hope you enjoy this delicious and popular Brazilian snack as much as we do! Everyone needs an easy and basic tomato sauce recipe that can be tasty enough to be used alone over pasta yet simple enough that it can be incorporated with other ingredients in a more complex dish. This is an easy recipe that can be done in 30 minutes if you are rushed, but best if cooked for a longer time – 45 minutes to 1 hour. This sauce can also be used as a base for tomato soup – just add more basil and a little more water (and omit the butter at the end). This recipe also freezes well. I usually make a larger batch and freeze several containers so I always have homemade tomato sauce. Using fresh tomatoes of course is the ideal base for a homemade tomato sauce, but since the best tomatoes are seasonal, I usually use tomato passata (which is Italian tomato purée) for my sauce. Passata is uncooked, crushed and sieved tomatoes with no seasonings as you may find in store-bought tomato sauce. You can use canned tomatoes as long as you buy from a brand that is organic and free of the chemical BPA (bisphenol-A). Chop onion, carrots, celery and garlic, reserve. Note: if you want to spend less time cooking the sauce, be sure to chop the carrots and celery into smaller pieces. Using a tall pot, sauté onions, carrots and celery in a few tablespoons of olive oil in low to medium heat until onions are translucent, but not burned. Add garlic and continue stirring until garlic is light golden in color (be careful not to overcook garlic or it will make the sauce bitter). Add the tomato passata and measure 1 of the jars with filtered or spring water. Add salt and pepper, and dried seasonings if desired (oregano, rosemary and bay leaf). Bring the sauce to a boil then simmer (covered but not completely) for at least 45 minutes, best for 1 hour (the longer it is cooked, the better it will taste). Stir frequently. If you want to make the sauce in 30 minutes, you will need to let the sauce cook in medium to medium-high heat, but will need to stir more frequently. Cook until carrots and celery are soft enough to be blended. You can also leave the pan uncovered to cook down the water faster, but will need to stir frequently and keep an eye on the sauce not to splatter all over your stove. Remove the bay leaf if using, and add fresh basil leaves. Using an immersion blender, blend all ingredients (do not blend bay leaf). If you don’t have an immersion blender, transfer all the ingredients in batches to a kitchen blender (leave the small top off the cover to let out the hot steam while blending). Transfer back to the pan. Season with more salt and pepper, if needed, and add butter. At this point you may cook the sauce for a longer period of time if desired. The butter adds richness to the sauce and helps balance out the acidity (taste-wise) of the tomato, another little trick is also to add a teaspoon of sugar – but cooking it for a long time also helps. It is now ready to be served. Wait until sauce is completely cooled before storing in the refrigerator or freezer. I hope you enjoy making this easy tomato sauce and use it in many of your favorite recipes! A great healthy smoothie can be made up of foods you enjoy to eat. A “super healthy” smoothie doesn’t necessarily have to be “super foods” you can’t pronounce or things you don’t enjoy. Nor does it have to taste unpleasant. I prefer to use as many healthy foods as possible in my smoothie, but I will admit my favorite recipe is somewhat of an acquired taste. I will show you how you can start with a basic recipe and build up to some more “potent” recipes for when and if you feel ready to increase the nutritional value of your smoothie. When I have a green smoothie first thing in the morning, I tend to crave less sugar and eat healthier for the rest of the day. I’ve also noticed I sleep better and my skin is more radiant. If I don’t drink it in the morning before breakfast then I’ll have it as an afternoon snack. I would not replace any of the recipes below for a meal as they are not substantial enough on their own to be considered a complete nutritious meal (unless you make sure to add enough protein to your smoothie). Drinking a smoothie is also a great way to get a nutritious boost if you usually skip breakfast or don’t wake up hungry. It’s fast and simple to make, and much easier to drink than to individually eat the same amount of ingredients. There’s no need for precise measurements, you can add as much or as little as you like of a particular ingredient or be as creative as you please. Just be mindful that the color (and taste) of certain foods may dominate the final result – if the color is important to you, start with smaller portions of certain foods until you see what they look like blended (I once made a gray smoothie but it tasted great); my husband doesn’t like to drink a green smoothie so I go heavier on the strawberries or the bananas. The basic green smoothie has any green fruit and/or vegetable in it. It is best to start with fruits and vegetables that are mild in flavor so that they blend well together. I usually add water or coconut water as I don’t like to mix vegetables with any type of milk. For a more nutritious green smoothie, you can add the following ingredients as super foods to the basic recipe listed above: spirulina, chia seeds, hemp seeds, turmeric powder, maca powder, goji berries, and protein powder. I highly encourage adding the following ingredients for extra nutritious benefits, natural sweetening, and flavor enhancing: more fruit, fresh ginger, fresh mint leaves, basil, dates, and/or honey. These can be helpful to disguise the taste of strong flavored ingredients like spirulina. Have fun experimenting and discovering your favorite recipe. Make small portions at first and don’t add too many ingredients until you know you like certain combinations! Enjoy! Uma vitamina saudável pode ser feita de alimentos que você gosta de comer. Uma vitamina “super saudável” não tem que ser necessariamente feita de “super alimentos” que não você não gosta. Nem tem que ser de sabor desagradável. Eu prefiro usar o máximo de alimentos saudáveis na minha vitamina, mas confesso que minha receita favorita leva um tempo para adquiri gosto. Mostrarei como você pode começar com uma receita básica e montar algumas receitas mais “potentes” para quando estiver pronto para aumentar o valor nutricional de sua vitamina. Quando bebo uma vitamina pela manhã, eu sinto vontade de comer comidas mais saudáveis e com menos açúcar o resto do dia. Eu também notei que durmo melhor e minha pele está mais radiante. Se eu não tomo antes do café da manhã, então eu geralmente tomo durante o lanche da tarde. Não substitua qualquer das receitas de vitamina abaixo por uma refeição, pois elas não são nutritivas o suficiente para valer por uma refeição nutritiva e completa (a menos que você adicione mais proteína na sua vitamina). Tomar vitamina também é uma ótima maneira de garantir uma boa dose de nutrição logo de manhã, especialmente se você costuma pular o café da manhã ou não acorda com fome. É rápido e simples de fazer e muito mais fácil beber do que comer individualmente a mesma quantidade de alimentos. Não há nenhuma necessidade medir os ingredientes e você pode adicionar ou eliminar qualquer ingrediente, ou ser tão criativo como quiser. Apenas lembre-se que a cor (e gosto) de certos alimentos pode dominar o resultado final – se a cor for importante para você, comece com pequenas porções de certos alimentos até você ver o que eles parecem batidos juntos (uma vez fiz uma vitamina cinza mas estava deliciosa); meu marido não gosta de beber vitamina verde então que coloco mais morangos ou bananas. Uma vitamina verde básica tem qualquer fruta ou verdura verde. É melhor começar com frutas e verduras que são leves de sabor, para que se misturam bem. Eu geralmente adiciono água ou água de coco porque não gosto de misturar verduras com qualquer tipo de leite. Para uma vitamina mais nutritiva, você pode adicionar os seguintes ingredientes como “super alimentos”: spirulina, sementes de chia, sementes de cânhamo, cúrcuma em pó, pó de maca, frutinhas de goji, e proteína em pó. Também recomendo adicionar os seguintes ingredientes que tem benefícios nutritivos e são adoçantes naturais ou ajudam a realçar o sabor: mais frutas, gengibre fresco, folhas de hortelã fresca, manjericão, tâmaras e/ou mel. Estes ingredientes também podem disfarçar o sabor forte de certos alimentos como a spirulina. Divirta-se experimentando e descobrindo sua receita favorita. Faça pequenas porções para começar e não adicione muitos ingredientes até que você saiba como certas combinações ficam! Enjoy! For the past two years I’ve been on a health(ier) kick researching and experimenting with natural recipes, raw foods, and vegan cooking. I’ve been drinking green smoothies almost every morning and have been trying to eat more plant-based foods whenever possible. I have not become a vegetarian or a vegan; nor have I adopted the macrobiotic, raw, or plant based diets. I have simply been more open to experimenting with recipes I would never have looked twice before. We have always eaten healthy foods at home, but ever since watching the documentary Forks Over Knives, my husband and I have been trying to eat more vegetables and plant-based foods. I have incorporated ingredients I had never tasted or heard of before, and I love this new discovery. Taste should never be compromised. To me, how food tastes is just as important as how nutritious it is, because if something is super healthy but tastes bad, you won’t eat it anyway. So might as well make nutritious food taste good for you to continue eating it. However, keep in mind that your taste buds will eventually adapt to certain flavors, so don’t be quick to discard certain healthy ingredients or “power foods” based on taste alone. Last Thanksgiving, I wanted to make a traditional pecan pie; one of the highlights of Thanksgiving for me. But when I read the many recipes and saw the list of ingredients, and saw how much sugar, corn syrup, and butter they require, suddenly I didn’t want to make the pie anymore, or ever eat it again. 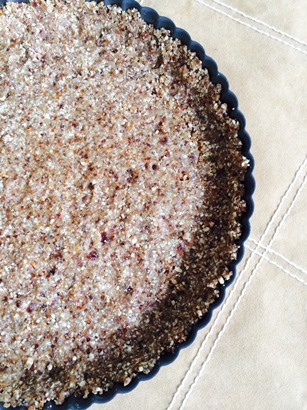 Fortunately, I found this recipe on Food52 that is a raw, vegan and no bake pecan pie that will make you smile. All the ingredients listed are healthy and naturally sweet. If you follow a raw or vegan diet, I guarantee you already have these ingredients in your pantry. If you don’t, I highly recommend having them for healthy snacking. The natural sweetener in this recipe is the Medjool date, which is considered the best and tastiest dates from the Middle East and North Africa. They are typically larger, fleshier, and sweeter than other dates. I substituted a mix of almonds and cashews instead of walnuts for the crust, but any combination of nuts works well. There’s no need to bake the crust or the pie itself, and it can be made ahead of time. I served it last year for Thanksgiving dessert and it was a success, so I’m repeating it this year. The best part is that the filling tastes just like the traditional pie (without the butter, sugar and corn syrup) and the crust is sweetly addictive on its own. You can leave this pie in your fridge for days… but I’m sure it won’t last that long. Likewise, you can make this recipe into pecan bars, or substitute the pecans for other nuts such as walnut. 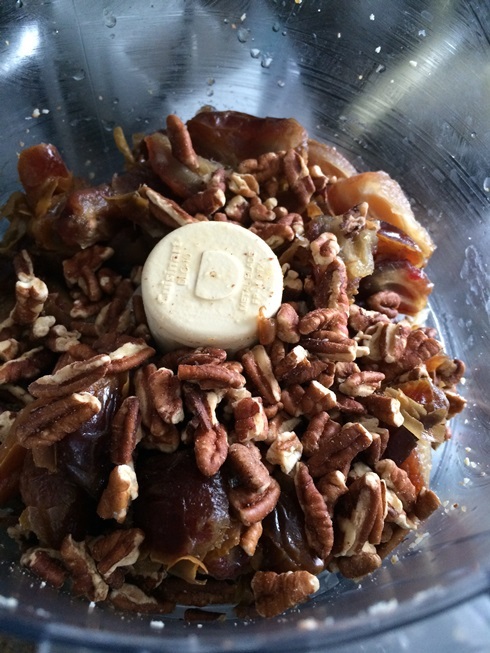 Put the pecans and any combination of nuts you choose (walnuts, almonds, cashews), shredded coconut, and salt in a food processor and grind (until coarsely ground, consistency of wet sand) Note: Careful not to over grind or the mixture may turn to nut butter! Use the pulse button of your food processor. Add the pitted dates and continue processing until the mixture begins to stick together. Press the mixture evenly onto the bottom of a pie plate or springform pan. Drain the soaked dates (reserve the water). Transfer to a high speed blender or food processor. Add the 1/2 cup (60g) of pecans, coconut oil, vanilla, cinnamon, nutmeg, salt and approximately 1/4 cup (60ml) of the water from soaking the dates. Blend until mixture is smooth. Pour the filling over the crust. Smooth the top and place in the fridge for at least 2-4 hours to set. 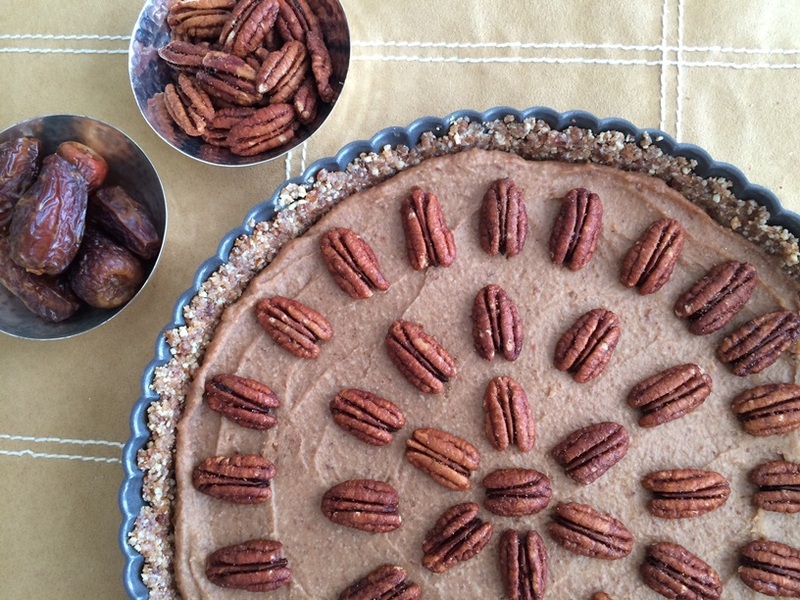 Decorate with 3/4 cup (90g) of pecans and continue to chill until ready to serve. I hope you enjoy this recipe and I already know you won’t miss the traditional pecan pie anymore, I know I don’t! :-) Happy Thanksgiving!! !